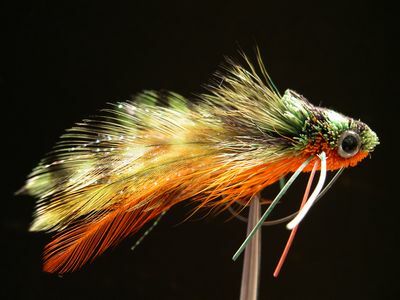 Get photo enhanced instructions for tying this deer hair frog and dozens of other flies for warmwater gamefish. New At Warmwater Fly Tyer! 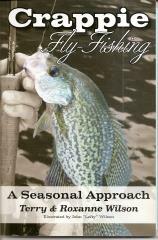 Crappie Fly Fishing: A Seasonal Approach is the Wilsons' most recent book on warmwater angling. Other books include Bluegill Fly Fishing and Flies, Fly-Fishing Techniques for Smallmouth Bass, and Largemouth Bass Fly-Fishing: Beyond the Basics. The Bronze Goddess is the creation of Mike Jacobs who is familiar with virtually every smallmouth bass stream in Northeast Iowa. I have fished with Mike when he used nothing but this little streamer taking as many as a hundred fish on a day's float. Mike also owns a fly tying materials store where you can purchase all of the materials required for the Bronze Goddess on-line. The link to Mike's on-line store "Hawkeye Fly Tyer" is near the bottom of this page. Click here to join Mike as he ties the Bronze Goddess. Mike also wrote an article for Fly Tyer magazine which describes in detail the rationale for the Goddess, how to tie it, and how to fish it properly. If you would like to read the article as it appeared in Fly Tyer magazine and you have Adobe Reader, click on Fly Tyer Article. As you navigate through the pages of Warmwater Fly Tyer you can click on most photos for a larger view. My favorite fly tying materials dealer is "Hawkeye Fly Tyer" owned by my fishing buddy Mike Jacobs who also owns a couple of clothing stores in Eastern Iowa. I live in a major metropolitan area that has four fly tying materials outlets but I still buy most of my materials from Mike because he has what I want. If he doesn't have it he will get it for me. Mike will deal with you personally by phone and his prices can't be beat. Give him a call the next time you need materials. You won't be disappointed. By the way, Mike Jacobs has virtually every material I use to tie the fly patterns on Warmwaterflytyer. If he doesn't have a material that you need I'm sure he will find it for you. As you navigate through the pages of Warmwater Fly Tyer you will occasionally be referred to a pdf file and you will need Adobe Reader to view it. If you don't have Adobe Reader click on the Get Adobe Reader Icon above to download it. As a Whiting Pro Team Member I am proud to use Whiting Feathers on many of the fly patterns found on WarmWaterFlyTyer. Click on the link below to learn more about the Whiting Farms operation, meet Pro-Team Members, and view the vast array of feather products available to you. I am proud to represent Dr. Slick as a member of their Pro Staff. 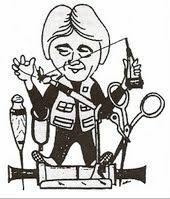 The Dr. Slick Company is the leading manufacturer of fly tying tools including scisssors, forcepts, bobbins, threaders, clamps, and bodkins. As a fly tier who loves to tie deer hair lures I have used the Dr. Slick's Hair Scissors since they were first introduced over twenty years ago. They are the best. To learn more about the Dr. Slick Company and view their line of fly tying tools, click on the link below.